The Lake House is definitely one of my all-time favorite movies. It’s marketed as a romance, but if I could make up any genre in which to place this film, I’d call it Romantic Sci-Fi, which I think is the best genre ever. I’m a big fan of intelligent romance–or any story that explores the complexities of relationships. And I also love science-fiction. Combining the two is something that’s not done nearly enough. The story is based on the Y2K Korean film Siworae (a.k.a. Il Mare), which by the way is correctly categorized on IMDb as “Romance, Sci-Fi.” The Lake House is the story of two people whose destinies were bound together even before they met. Dr. Kate Forster (Sandra Bullock) has been living at the lake house. Now, in February 2006, she takes a position at Chicago City Hospital and moves to a city apartment. She leaves a letter in the lake house’s mailbox, asking the next tenant to forward her mail. 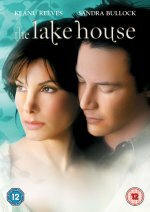 The problem is, the “next tenant” is Alex Wyler (Keanu Reeves), who bought the lake house before she even moved in, back in February 2004. Anything Kate puts into the mailbox is delivered 2 years earlier, and anything Alex mails, Kate finds there in 2006. The two pen pals begin exchanging letters, and a relationship blossoms. Welcome to your new home. As the previous tenant, let me say, I hope you like living here as much as I did. I filed the change of address with the post office, but you know what a crapshoot that can be. So if anything slips through, would you please do me a favor and forward my mail. I’d appreciate it. My new address is below. Thanks in advance. P.S. Sorry for the paw prints by the front door. They were there when I moved in. Same with the box in the attic. I got your note, and I’m afraid there must be some kind of misunderstanding. As far as I know, the lake house has been empty for several years. Maybe your note was intended for the Sandburg house down the shore, since no one has lived in this house for years. But I’m curious about the paw prints. I’m very familiar with the Sandburg cottage, and I can guarantee I never lived there. I’m old fashioned, but I don’t think a cottage should be over 6,000 square feet. So let me try again. I used to live at the lake house. Then I moved. Now I live at 1620 N. Racine in Chicago. I’d appreciate it if you would forward my mail if you get any. Oh, by the way, it’s 2006. Has been all year. Ask anyone. I went to 1620 N. Racine, and it’s not there. It’s just a construction site. From the pictures, it looks nice, but not for another 18 months. What am I missing here? Maybe you got the address wrong, because I noticed you got the date wrong, too. Two things really draw me to this film, as a storyteller. Firstly, it has good interaction between character and plot. From the way they write, it seems many science-fiction writers–especially beginners–don’t understand how important character conflict and change is, because their stories are so heavy-laden with techno-babble or strange occurrences. Similarly, new romance writers often underestimate the value of plot-based conflict to move their stories forward. Making character and plot work together isn’t a matter of getting the right “mix,” but the right relationship between the two. Both character and plot should be going full bore. Because characters react to the plot, and they determine the plot. In other words, the draw of The Lake House is not the magic time portal that sends letters across 2 years. The draw is that these particular characters encounter the time portal, and use it to establish a relationship, and it affects their lives in a way that could not have occurred otherwise. The second storytelling draw of The Lake House is the complexity of the characters. Complex characters are common in romance, of course, but not so much in science-fiction. That may make this film more of a “SF romance” than “romantic SF,” because maybe most SF fans can’t understand character complexity. (It’s a thought that’s occurred to me, anyhow.) They can’t understand that Kate is miserable and empty, and that Alex speaks to her soul. Nor that she has met Alex before, multiple times, and that she doesn’t remember him, because her own problems have absorbed her thoughts. They can’t understand that Alex bought the lake house because it brought him closer to his estranged father, and that he allowed Kate to move into the house, only because she was already an integral part of his present and his future. Romance fans (i.e., “women”) are likely to love this film. Sci-fi fans (i.e., “men”) are likely to rate it as okay, not the worst chick-flick ever made. Interestingly enough, on IMDb, males under 18 rated The Lake House almost as highly as the girls did, with the highest chunk of those boys giving it a 10-out-of-10 rating. I think I will think twice before joking about testosterone-crazed, adolescent boys again. One more note: Inspired screenwriting and cinematography permeates this film. I won’t talk about it much, except to say that for me to mention the cinematography, it must be really worth mentioning. Because for me, cinematography is normally one of those things that if you notice it, the director has done something wrong. Cinematography is a tool you use to tell the story. And wild cinematography gets in the way of storytelling. This is one of those rare cases, however, in which the cinematography goes above and beyond its call. It tells the story, but so artfully that it leaves me with that “That’s so kewl!” feeling. 8. Best Secondary Character: Simon Wyler (Christopher Plummer), Alex’s father. He actually has a personality, which is pretty important, because he’s such a significant influence in Alex’s life. He fills a room with his presence and is demanding on his underlings, including his sons. He’s been described as a “sadistic, bitter, bitter, bitter old man.” For a long time, Alex refused to have anything to do with him, because of the way the old man acted when Alex’s mother died. But then when the old man himself dies… It’s because of Simon Wyler that we get to see what a deep, complex character Alex is. 7. Best Song: Paul McCartney’s “This Never Happened Before,” which will never feel quite the same to me again. It’s the closing theme of the film, and it’s also the song Kate and Alex dance to at her birthday party. (See “Most Romantic Moment” below.) And furthermore, it’s the coolest anachronism in the film. As I said, this song was playing at Kate’s birthday party, in the autumn of 2004, shortly before Alex’s father dies on October 6, 2004 (according to the death certificate visible on-screen). However, Paul McCartney didn’t actually release this song until September 13, 2005, a year later. 6. Coolest Plot Hole: There aren’t many plot holes, and most of the so-called plot holes that fans identify aren’t really plot holes at all, just misunderstandings of the rules of the magic of the lake house. There is a set of rules that explains all the supposed plot holes, except for one. Just before Kate sends Alex a scarf, writing to him that there was a freak snowstorm in April 2004, she looks at a picture taken April 3, 2004, and notes that Jack (the dog) was not happy that day. But April 3, 2004 was many months before Jack had run into her life. In April 2004, Jack was with Alex, at the lake house, not with Kate. 5. Coolest Camera Angle: From inside a revolving door. When Henry Wyler goes through the revolving door, the camera follows him through. Then the camera continues around, in the door, so we can see via reverse angle that Henry’s companion, who he had been talking to, has remained behind. The door and camera finally come to rest pointing forward, where we can see Henry go out to reunite with his brother Alex. 4. Most Hitchcockian Moment: Or rather, “moments.” Twice in the film, Kate sees Cary Grant and Ingrid Bergman on TV, starring in Alfred Hitchcock’s Notorious. 3. Most Romantic Moment: Kate’s birthday party. Depressed and struggling with doubt and loneliness, she ends up dancing with some random guy and kissing him. Some random guy indeed! (It was Alex.) Alex knew exactly how to speak to her soul. But Kate wouldn’t even remember him. (She never remembers him.) The classic romantic moment, doomed to fail. 2. Saddest Moment: As Kate discovers that Alex’s father has passed away, exactly 2 years after the fact. She rushes to the lake house, and leaves a touching letter in the mailbox. It appears, when need be, Kate also knows how to speak to Alex’s soul. Or maybe the saddest moment is when Kate breaks up with Alex, as it were. I can’t go into why that’s so sad, because it would spoil the plot. Suffice it to say that it gets more heart-wrenching each successive time you watch the film. 1. Most Dramatic Moment: The climax. Sorry, can’t tell you more about it without spoiling the plot. But I will say that I knew how the story ended before I saw The Lake House for the first time, and I loved the climax just the same. In summary, if you like a good romance, or just a good tear-jerker, The Lake House is worth checking out. Today was one of those days I felt like watching some Gilmore Girls. Yeah, I’ve been watching all kinds of stuff that’s not GG. You know what they say: Absence makes the heart grow fonder. And today was one of those fond exceptions. You know… I actually stopped counting how many times have I watched this movie. I totally connected with it, although I don’t know why. It’s out of logic, it’s SF, but it’s absolutely beautiful! Songs are all great. Jacky is adorable (I even gotta dog of my own now)and it made me wonna write letters, since no one does it anymore. By the way, it was a very nice detail posting their letters. Thanx. Oh! i love this movie! I cant stop myself of thinking kate’s feelings n the way Alex believes in her. Thinking about the plot n the role the time plays, i always feel great. I wish something such nice could happen with me!